You’ve heard about how a good image can be the cherry-on-top to already high-quality content. You know that keywords will earn your page a higher Google ranking. But did you know that links — both external and internal — can improve content in all the right ways? Supplement your content with links and you’ll not only improve your SEO, but you can also guide your audience through the sales and marketing process of your choice. Links are central to improving the quality and reach of content. Perhaps the most significant benefit of placing links in your content is improving your SEO. Google’s algorithm tends to reward websites that have effective links in their content with a higher page rank, making your brand easier to find in the endless expanse of internet content. Google rewards content with links partly because the search engine looks for high-quality content. By providing further resources for your readers, links take your content to the next level. In addition to improving SEO, internal links can be an effective means of guiding a user through your website. Let’s say, for example, that someone happened to land on your foodie website by Googling “how to cook a meatloaf that people actually want to eat,” which brought them to a killer meatloaf recipe. At the end of the content, you have the anchor text: “For more great recipes like this one, check out our new cookbook!” The link takes the user to a page where they can buy your cookbook, which is where you ultimately want them to end up. While some strategies that improve SEO can take more time, such as researching and effectively implementing keywords, using links is a relatively simple strategy that you can continually implement to improve your content. Links can certainly help your SEO, but if you don’t incorporate them into your content correctly, Google may penalize your website, and all your work will be for naught. First, we’ll focus on internal links, which are links that take users to other pages on your own website, as opposed to external links that take users to other websites. Before you can have any internal links, you need to have plenty of content and pages on your website. A successful linking strategy only works if you have a consistent and effective content strategy in place. Links supplement content, but they certainly don’t replace it. The more content you have on your website, the more internal links you’ll be able to form between pages and the longer you’ll be able to keep users entertained on your site. Now let’s talk about external links for a moment. Some businesses hesitate to give their competitors attention by linking to their websites in the business’s own content. When it comes to linking, you may need to suppress your competitive side and think about what would benefit your users the most. If your competitor has a great piece of content that you don’t have but that could supplement your content for your audience, link to the page. Such a helpful link will improve your content quality and consequently increase your page rank. Once you have your content written and some links picked out, you need to connect your link to some anchor text, which is the copy that users will click on to follow a link. Don’t feel the need to work hard to create an exceptionally specific anchor text. In fact, optimizing anchor texts may earn your page a penalty from Google. An anchor text becomes optimized when the text is also the same keyword used by the URL and the page title. Google sees optimizing anchor text as cheating the system and simply won’t have it. Instead, anchor your links to natural, innocuous portions of your sentence. 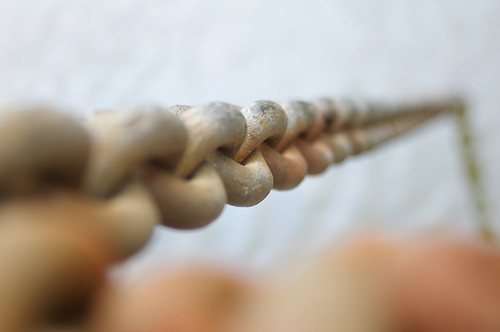 If links help your content so much, should you link every other word? You could, but that many links won’t necessarily help your case. They may even hurt it. Google asks that websites keep links to a reasonable number, which may not help us folks who would like some more specific details. Unfortunately, there isn’t much specific guidance out there. As is the case in many content marketing situations, the number depends on the situation. Three to five links is generally a safe number for most blog posts and articles, though you may need more depending on the content subject and length. With so many options, what types of pages and content should you link to? First, let’s talk about a type of link you should avoid. Some businesses feel that if they just link back to their homepage, they’re fine and safe. After all, that’s the hub of the website, isn’t it? But rather than leading a user to a destination, linking to a homepage just sends them to another crossroads. As much as possible, avoid linking to top-level pages (pages with links in the website navigation menu). The deeper your links go into your site, the better. As mentioned above, we all need to stop seeing links as just another means to improve SEO — even if that is the end goal — and more as a way to add value to your content for the reader. Don’t link to a random page just to get the SEO benefits. Link to relevant content that answers questions that may arise during the reading process, or that adds helpful information that you may not have been able to expand upon in the content. For example, if you’re an HVAC company and you have a blog post about how homeowners can maintain healthy indoor air quality, you could link to another page that discusses the benefits of whole-home air purifiers, or you could link to a product page with several air purifier options. Don’t just link to a page selling smart thermostats. Save that kind of link for a relevant piece of content. As always, your content campaigns should be determined by your strategy. If you want to lead people to a certain page on your website, plan relevant, helpful content that can link to such pages. If you want to sell a certain product, for instance, write a blog post that discusses the benefits of the product and include links to the product’s page. 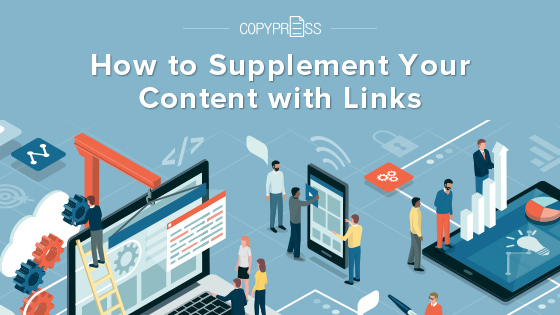 Supplementing your content with links is a simple way to improve content, increase your page rank, and send your audience where you wanted them in the first place. Most importantly, links make your content a more comprehensive resource for your readers, which satisfies your audience enough to leave them wanting more.